The Long Beach Peninsula offers vacation rental homes to accommodate your family or group on the Long Beach Peninsula. With a diverse selection of vacation rental properties, ranging from small beach cabins and bungalows to large, luxury properties, you will find exactly what you are looking for! Wake up to a stunning 180° Willapa Bay view! Beautifully appointed one bedroom/bath, private-entry, plus kitchenette. Munch on our delectable snacks while hooked to the WiFi. Turn out the lights and sleep well tonight! Completely furnished historic ocean front homes. Big House (1887)-3 bdrms, sleeps 8. Cottage-2 bdrms, sleeps 6. TV/VCR/DVD; W/D; microwave. No smoking. Large fenced yard. Easy walk to beach. Weekly rates. BEACH VIEW! 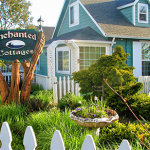 A Picturesque Victorian Sea Cottage, circa 1890, located five blocks N. of the Long Beach approach, it’s a quick walk to beach and town and five blocks from LB Boardwalk & the 8.5 mile-long Oceanfront Discovery Trail. Use Boreas Inn’s path to the beach or take quick walk down 6th St. North. Cottage has 3 BR/1 BA, Euro-bed/couch in living room, sleeps six. FE kitchen, linens & towels provided. Kids & pets are OK. Cottage has large yard with lawn, surrounded by a white picket fence with view to the beach. Features covered wrap-around porches, bear claw tub and shower. Perfect family or couples vacation rental getaway! 2 day min/1 wk. summers $150/night $995 wk. plus cleaning, pet fees and tax. Prices subject to change. Affordable, comfortable, updated Long Beach home. Easy walk to beach, boardwalk. Easy walk to everything. 2 bdrm w/kings. 2 bath. Washer/dryer. Games, puzzles, books, movies. TVs, DVD players, cable. Abstract Game Room, private deck. WA State Parks’ historic coastal residences await you! Turn of the century lightkeepers’ homes: scenic river & ocean views, available year round, off season discounts. Cape Disappointment State Park features three unique Lighthouse Keepers’ Residences within walking distance of North Head Lighthouse. Visitors can tour the park’s historical coastal fort and the Lewis and Clark Interpretive Center, and enjoy sandy beaches & pristine forest trails. The Head Lighthouse Keepers’ Residence offers visitors a breathtaking view of the ocean. The century-old two-story Victorian-period house features a comfortable living room with TV & DVD, separate dining room/library, tiled kitchen w/modern appliances & 3 bdrms w/2 queen-size & 2 single beds. Historic vacation rentals (refurbished & updated officer’s quarters) are also available at nearby Ft. Columbia State Park, offering spectacular Columbia River views. Whether an ocean front condo, casual beach cabin, or large group vacation home, PRPM has it all. Offering fully equipped kitchens, wifi, and on-site laundry…pack your clothes and food and let us provide the rest. We also have a selection of pet-friendly units available so no one gets left behind. Over 20 years of vacation experience here on the Long Beach Peninsula, Call PRPM for all of your vacation needs. A cute, cozy, updated beach cottage on small pond to enjoy quiet time, beach, clamming, relaxing. Sleeps 3 in a double bed and pullout couch, viewing deck, mini kitchen, full bath, fire pit. Close to activities but quiet area. Best sleep ever. TripAdvisor Top Honors past 4 years. 2 unique theme cottages. All: Heavenly beds, plush linens, full kitchens, many extras, free fast wifi, Netflix and basic cable. Hollyhock Quaint 1BR (2+2 children)-antique brass bed, LR slpr sofa, DR/full BA. Captain’s: Romantic upstairs Studio (2)-clawfoot tub (no shower), slanted ceilings in kit/bath. Close to Beach, Discovery Trail, excellent restaurants. Secure online booking required. 3 spacious ocean view bdrms, two bathrms. Free Wi-Fi, long distance, flat screen BluRay TV. Barn for 6 horses, round pen, indiv stalls & attached outdoor paddocks. Feeders, buckets, forks & wheelbarrows. Enjoy walking or riding to the ocean. This spacious, fully furnished 2 bdrm 1 bath condo is located in downtown Long Beach just steps away from the historic Bolstad Arch. It’s a perfect base for exploring the wonders of the area and relaxing in comfort. Experience history while discovering present-day treasures at the 1891 Klipsan Beach Life Saving Station, later #309 Historic Coast Guard Station. Located just over a block from the beach, the property is perfect for reunions and large family gatherings. Three residences feature fully-supplied gourmet kitchens, comfortable beds, and enough complimentary activities to fill even the stormiest day. The expansive grounds are fully fenced, complete with a dog run, fire pit, grill, and gazebo. Cozy, comfortable, and colorful – this little beach cabin is just steps away from a trail to the beach and blocks from the Long Beach Arch, restaurants, shops and activities in downtown Long Beach.